It's great fun when your hobby gets exposure. Walter and I are doing our best to tell the world just how cool 3D printing is. For Oslo Mini Maker Faire, the national broadcaster did a full 15 minute feature on Walter (my son). He'll soon be in an article in Magasinet/Dagbladet as well and today it was my turn. During the last 3DP meetup at Bitraf, we got visits from a couple press outlets. Liam, Ketil, Elias and myself was interviewed and it took quite a chunk of the first day. The first to surface of these were a 2 page article in the magazine "Hjemme PC". Tonight, the TV show called FBI (ForBrukerInspektørene) had a nice segment on 3D printing as well. The main segment was from the Meetup, but as a fun side-note - the printer mentioned initially (that had some problems printing a good iPhone cover) was fixed a few days later by Ketil. If you want to check out 3DP and are nearby Oslo mid October, feel free to drop by the 5th 3D Printer Meetup! I saw a news report last week on 3DP. 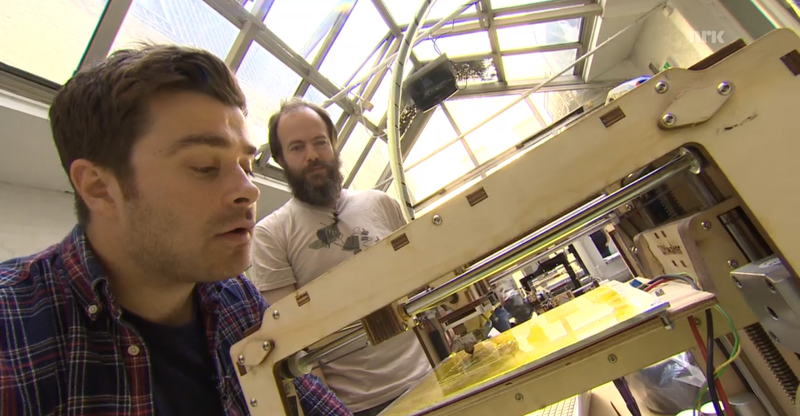 It looked amazing and the report documented how we will all have a 3D printer in our homes by 2020! Really 3D printing will be a amazing think. Right now I’m also thinking to learn about it and wanna build a own small business shop. I can not tell you how excited I am about 3D printing!! Thanks for listing some resources about the subject as I am deep into learning/research mode.